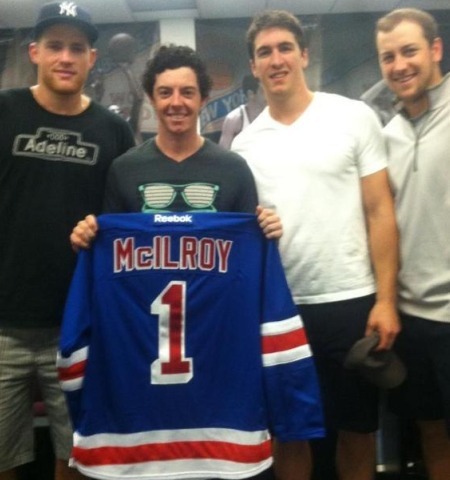 Rory McIlroy with a blue, white and red New York Rangers shirt.Rory McIlroy made another celebrity appearance this week but it wasn’t tennis or basketball fans who got to see him in the flesh. The world No 1, who will be chasing the $10m FedEx Cup bonus alongside World No 2 Tiger Woods in the Tour Championship at East Lake in Atlanta from Thursday next, met members of the New York Rangers ice hockey team at Madison Square Garden. McIlroy has been training with the New York Knicks basketball team this week as his trainer Steve McGregor is also the NBA side’s fitness guru. The Knicks also play their home games at The Garden, which has hosted numberous sporting contests, including the first meeting meeting between heavweight legends Joe Frazier and Muhammad Ali. Pádraig Harrington will know that when his favourite German metal band Rammstein gave their first performance in America in 10 years as part of their Liebe ist für alle da Tour on December 11, 2010, tickets were sold out in less than 30 minutes. Ryder Cup rookie Rory McIlroy says he’s “quite confident” that Europe can win back the trophy at Celtic Manor next month. Rory McIlroy has a date with Caroline Wozniacki in Cincinnati this week. Picture by Fran Caffrey/www.golffile.ieRory McIlroy and Padraig Harrington will relieve their US PGA frustrations by chasing birdies this week. The pair finished near the back of the field on 11 over par after closing 74’s in steamy Atlanta. But while the Dubliner is a last minute entry for this week’s Wyndham Championship in Greensboro in desperate bid to make the FedEx Cup play-offs, McIlroy will be at the tennis in Cincinnati, swooning over new love match Caroline Wozniacki.